The Prime Minister of Papua New Guinea, Peter O’Neill will welcome Mr. Patrick Pouyanné, the Chairman and Chief Executive Officer of the French Oil and Gas Company, TOTAL S.A., when he visits Papua New Guinea this week. Mr Pouyanné will arrive in Port Moresby in the evening of 14 April, and undertake a series of meetings with Government officials and private sector representatives, and meet Prime Minister O’Neill on Friday morning. “I welcome Patrick Pouyanné and his delegation to Papua New Guinea, and look forward to further discussing preparations to deliver the Papua LNG Project,” the Prime Minister said. “We are pleased to have TOTAL as a partner with Papua New Guinea as we work to construct the Papua LNG Project. “Despite the challenges of the the oil and gas sector is facing, TOTAL and Mr Pouyanné remain committed to delivering the substantial project. “The Papua LNG project will deliver well over 10,000 new jobs to Papua New Guinea in the coming years, in the same way as we saw during the construction phase of the PNG-LNG Project. 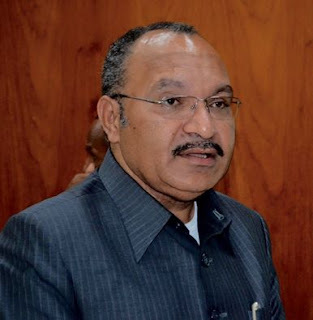 “This will see Papua New Guineans gaining more skills, will generate business for SMEs and empower communities that are connected with the project. “TOTAL has shown true commitment to Papua New Guinea though its ongoing confidence in our economy, despite current slumped commodity prices. “TOTAL is investing in Papua New Guinea for the long-term so is undertaking investment now in preparation for a stronger oil and gas sector in the years to come. “Papua New Guinea further welcomes TOTAL’s commitment to downstream industries in the country and playing a broader role in our economy and our communities. The Prime Minister said the relationship between Papua New Guinea and French companies continues to expand as a consequence of direct bilateral engagement, and this will continue to grow. PM O’Neill addressed a series of business forums in Paris last year and will speak at a major business and investment forum that is planned for Paris in the coming months.